When we first retired we began taking six week trips to France. Last year we extended that to seven weeks, braving the presence of Satan’s Little Disciples in the last week of our trip. This year, in lieu of a spring trip in Britain, we decided to go a week earlier than before which pushed us into the eight week arena, still much less than some of our acquaintances but a bit “scary spiders” for us, nonetheless. Crossing on 15th May, our first three weeks were blisteringly grand – France was having an excellent spring in the same way that we i Britain did. The French spring had been so “good” that many of their regions were already in a drought situation with water usage restrictions. What’s good for the tourist isn’t so good for the farmers, which is where the vast majority of their water goes. 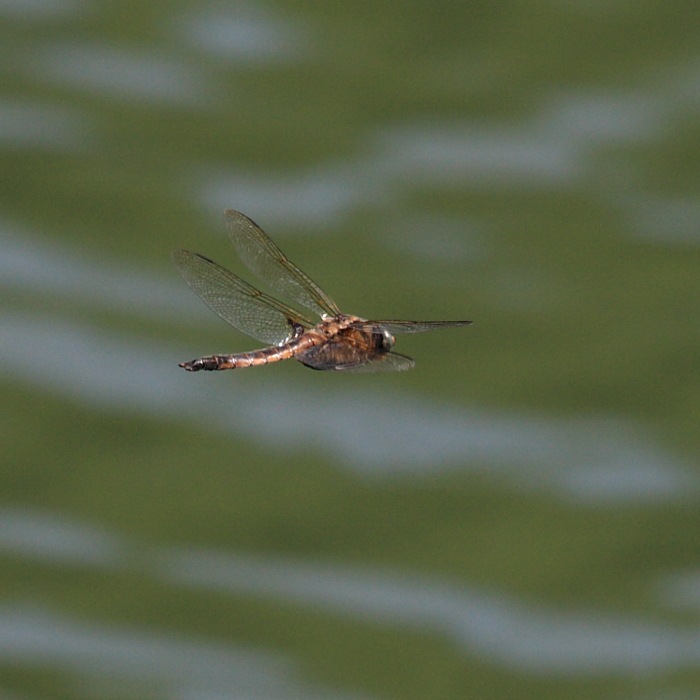 The Dragonflies seemed to be enjoying the fine weather, too. Our first significant stop was for two days on Le Loir at a village called Luché-Pringé, reasonably close to Le Mans. Last time we were here our car broke down forcing us to stay for nine days while “la Vectra Anglaise” was repaired. This visit was smoother, fortunately. On our second day amongst the dragonflies beside the river, I spotted a stranger. The stranger steadfastly refused to settle but I managed to grab an in-flight shot of the culprit receding as it headed for the middle of the river. I had no idea what it was and consulted more experienced spotters upon our return. This character is a (probably male) so-called Two-spotted Dragonfly or Eurasian Baskettail (Epitheca bimaculata). Our location put it somewhat beyond its accepted range, so it was quite a rare spotting. One of my experts also said that they’d never seen an in-flight shot of this species before so I was v. lucky to get it. In the second half of our break, most of which was spent in relatively unsettled weather on our favourite dairy sheep farm at Fanjeaux, we, that is to say Carol, spotted another interesting visitor. I actually missed it engaged in placating other English campers with an electricity problem – and I still haven’t forgiven myself. I Was prepared to book a special trip to Sardinia to see these stunning beasts. Carol, with the “wrong” lens on her camera, managed to grab this excellent shot, nonetheless, and described it to me as being “like a Scarlet Darter but pink”. 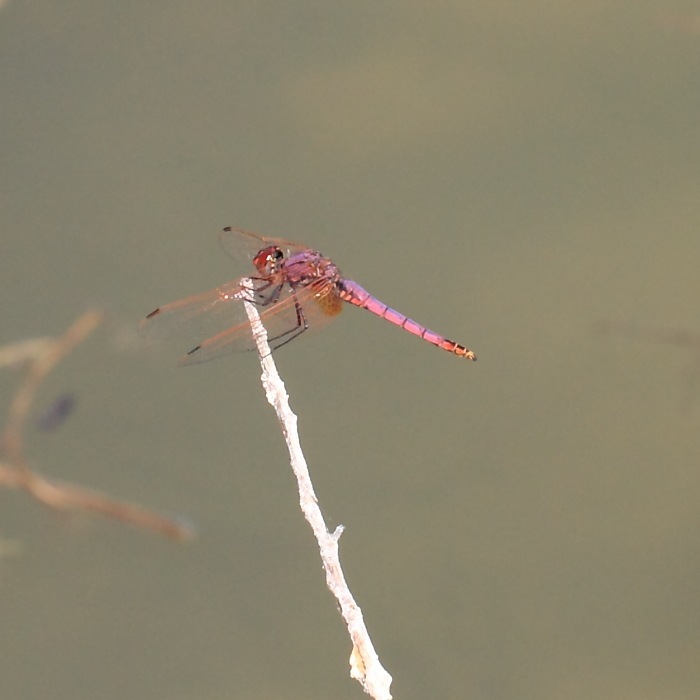 When I looked I shelved my disbelief and knew immediately that this just had to be a Violet-marked Darter (Trithemis annulata). At best this, also, was on the north-western edge of its range and possibly beyond. What a staggeringly beautiful creature and I’m still as sick as a parrot that I missed seeing it.